One of Cannon Falls' two foreign exchange students, Izzy, brings a positive outlook along with great stories to tell. It was the last week of summer. I was excited, nervous, and sad to say goodbye to swimming on hot days, laughing around a campfire, staying out late, and sleeping in. Trying to ease my mind, I decided to go watch a home boys soccer game behind the elementary school. After the first game was over, a fairly short, skinny guy with black hair and brown eyes that I’ve never met before walked over to me. With his hand extended he said, “Hi my name is Izzy, I am the new foreign exchange student from Brazil.” Smiling I introduced myself; not knowing at the time that Izzy would become one of my closest friends. Izzy is incredible. 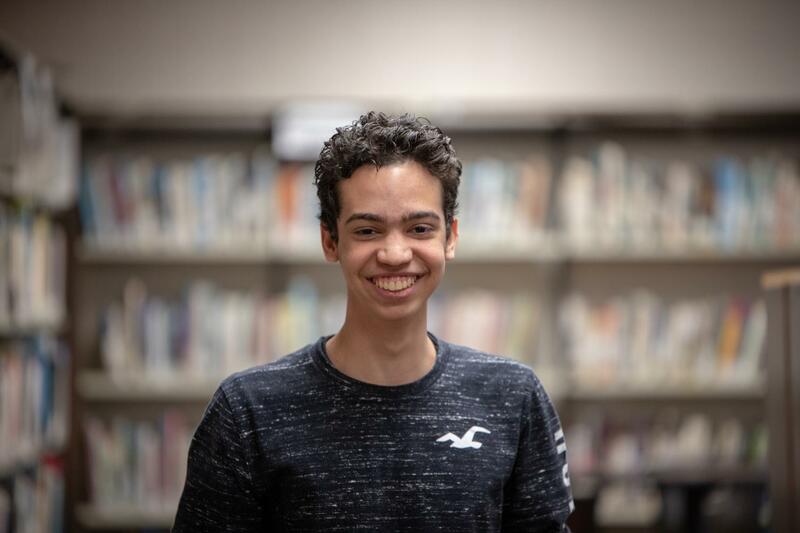 What makes Izzy so wonderful is that as an exchange student he has gone through a lot more than most Cannon Falls students could imagine while continually embracing our school, culture, and community with a positive attitude on a daily basis. Being an exchange student meant Izzy was forced to leave his home country and family. When I asked Izzy how he felt on the plane ride here he illustrated that “I was really nervous and I started having second thoughts.” The plane ride was an emotional journey that only made Izzy anxiously await arrival in the United States. Since he has been here Izzy has been exposed to wide range of new things, one of them being the Minnesota weather. So far Izzy would say Minnesota is very cold, but he admits that people have told him that the worst is only yet to come. Another thing that is very different in Cannon Falls than in Brazil is the schooling system. Attending a school in the United States is extremely different than going to a school in Brazil. When I asked Izzy how his old school was different from Cannon Falls High School he said that, “Here you can choose some of your classes. You have a lot of options to pick. You need to go to other classrooms, you don’t stay at the same room for the whole school day. You don’t need to wear uniforms at school. Here, the school days are longer, but that is not a bad thing actually.” The opportunity to be in a plethora of activities has been very exciting as well. Izzy not only is engaged in the classroom, but he also enjoys participating in other activities too. Hoping to join and become involved in other activities as well, Izzy was already on the boys soccer team and currently is a member of the robotics team. Outside of school Izzy has been trying countless American foods like waffles, with peanut butter and maple syrup, and s’mores, which both are a few of his favorites. In the short three months that Izzy has been here he has made many memories.”So far I don’t think I have a favorite memory. Everyday I make new ones. I would say that spending time with my friends always give me good memories. They are awesome people, who knows how to make my day, no matter what,” Izzy said. By having this mindset, Cannon Falls has been very lucky to add Izzy to the community. Looking back on all the things I’ve done with Izzy and my friends since the first time I met him, all I can do is smile. Whether it was eating super spicy wings, playing card games, watching movies, cheering at sporting events, running to Target, shopping at Mall of America, or baking chocolate chip cookies, with a huge smile Izzy has continued to keep an open mind. He is my role model. Someone like him makes me want to be more appreciative, work harder, stay positive, and try things outside of my comfort zone. While he’s here, talk to Izzy. Ask him about Brazil and his culture. Even though Izzy says on a daily basis how much he loves the United States, he needs to the realize that the United States and this community loves him back. Cannon Falls is very lucky to have added an amazing individual from across the world.